Don’t get me wrong the aftermath of messy play can set you back days on your cleaning schedule and even just the thought makes most mums wince. But exploratory play is really important and for most kids the messier the better! What most of us forget is that the brain is a muscle. Not only should it be exercised but, exercising it well will also ware you out. This is the same for young brains and good to remember during rainy days, when they need to be worn down but can’t go outside to burn off their excess energy! Dont over stretch yourself or throw everything at them at once. Set projects and tasks. Things that you can work on both individually and collectively. With tasks you can pick back up as and when it’s appropriate. Have a go during times you know it’s inevitable that they’re going to get dirty. Like after dinner. Or just before bath time, you might as well get your moneys worth out of that clean, warm water! Chalks on either a chalk board play table or outside on the garden patio. Buy a sketch paper roll that you can just roll out anywhere and paint/draw on or even craft with. Ikea have 10m rolls for as little as £4! Hobbycraft sell various messy play projects, with everything included. 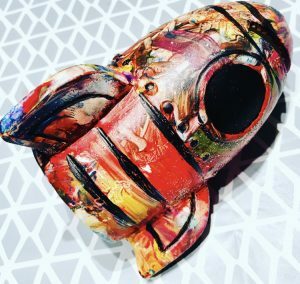 Like this rocket 🚀 piggy bank. For just £1.75! Ultimately have fun! Discus colours, shapes, ideas, how their day is going. Let them express themselves and join in. After all letting go is therapeutic! Awesome, thank you! And yes so…much…fun! Well at least until its clean up time! Definitely, when I think about what messy play involved when i was a kid; getting muddy, running wild and then how much we restrict our kids these days. 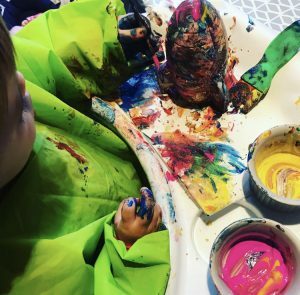 You really do have to let them get messy and creative at least once in a while!